Kaieteur Falls, Kaieteur National Park, Guyana. The park’s mission is to preserve the wonderful environment, unspoiled nature, fauna and flora. 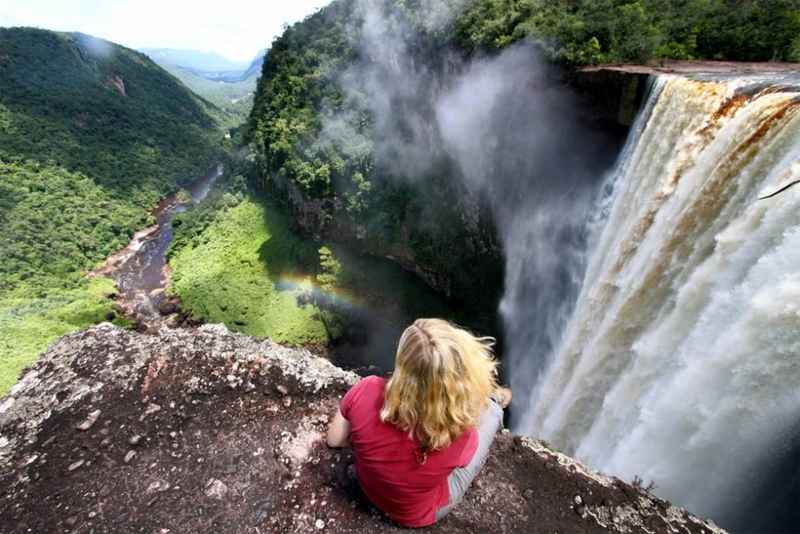 At the heart of it is the most precious gem – Kaieteur Falls, whose plunge drops for 226 m (741 ft) down the steep cliff. Its average flow rate is among the most powerful in the world. The whole experience is truly unique and unforgettable: the visitors who are keen to see the single-drop waterfall have to find their way through an ancient misty rainforest. The adventurous types even dear to stand on the precipice and look down the abyss. Incidentally, it is estimated that at 2.99 billion years old this plateau might be the oldest rock on Earth. All year round. The plunge is the widest during the rainy seasons – one takes place from May to mid-August, the second – from mid-November to mid-January. However it is the best time to go at the end of the monsoons. This is not the most accessible part of the world. The best way to get there is by plane from Georgetown – the capital of Guyana.